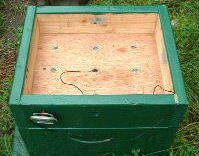 Temperature Humidity Self Control Unit (THSCU) or How to keep bees healthy. To me, there is no doubt that each hive, as a good house, has to have a well insulated and well ventilated ATTIC! 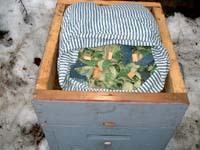 And one of beekeeping axiom states:"Cold does not kill bees, but wetness does." The main component of my THSCU is wool since it is the best natural air conditioner for all seasons. 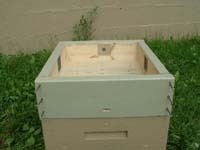 Also, proper ventilation is very important, because when hot air rises within the hive it absorbs some of the moisture from the wet air. 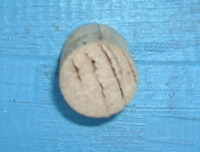 In THSCUs, part of the remaining moisture is absorbed by the wool. On the other hand, over-ventilation during the winter significantly lowers the temperature within the hive and forces the bees to consume greater amounts of forage. Therefore, correct distribution of wet air by using wool and seasonally controlling the number of open ventilation holes is key to my THSCU. 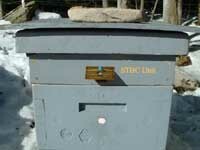 I have been using my THSCUs since 2003 and have installed these units in 20 hives. The results are excellent, so I will make THSCUs for the rest of my hives as soon as I have more time. I use my THSCU year-around. Why I decided to use wool? "Wool is the only fiber used by man that is able to 'breathe'. 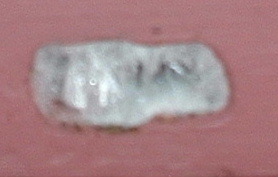 It can absorb up to a third of its weight in moisture without becoming clammy or damp. The moisture then evaporates into the atmosphere, assisting our bodies' efforts to keep cool and acting as a natural air conditioner. No man-made fibre can match wool's unique combination of warmth, absorbency, insulation, resilience, texture and sheer versatility. Wool fibre can be used for anything from high fashion garments to soaking up oil spills!" "Wool Bloc™ insulation breathes - synthetic materials like fiberglass do not. As a natural product, Wool Bloc™ can absorb and desorb moisture keeping you warmer in the winter and cooler in the summer, and providing superior performance to synthetic fibers throughout the year." 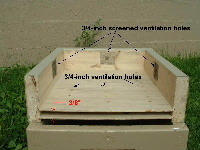 I do not use Inner Cover because my THSCU already has upper entrance/ventilation hole located on the front board between the bottom and upper boards. 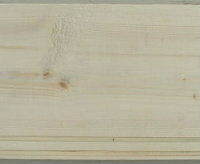 A table saw is needed to cut two grooves in each of the four side boards(2" X 6"). The bottom board (floor) is similar to the upper board. I recommend to drill minimum nine 1-inch holes on the each board. 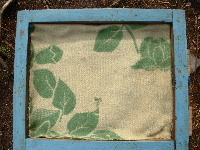 The upper board's holes are screened. 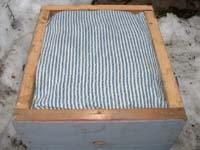 A wool block (or wool blanket) placed on the upper board for the cold months only. Also, there are three (or six for hot climates) additional 3/4-inch screened ventilation holes that are plugged for the winter with wine corks. All holes were drilled at a small angle. 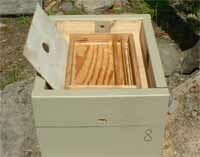 During warm winter days, the sun heats the hive, including the area around the entrance hole. High temperature provokes bees to leave the hive. Typically, bees land on cold snow and subsequently die. Considering this behavior, I installed an upper entrance sun cover in order to create shade, thus minimizing the heating effect of the sun. In general, the impact of the cover depends on its size. Moreover, my THSCU has enough room for a feeder. Click on the pictures to view larger images. 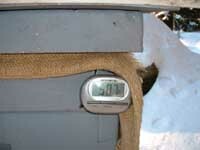 January 04, 2008, 7 a.m., the outside temperature was -20 degree Celsius (-4.0 Fahrenheit). This picture shows how well my hives are ventilated. The hot air rises in the hive and absorbs the moisture from the wet air. 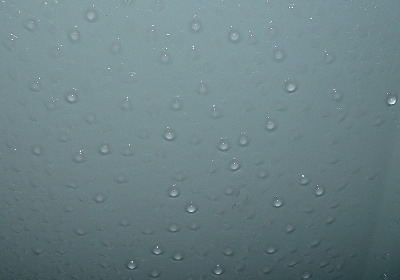 Because the temperature was very low, the wet air crystallized. 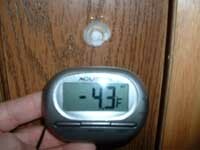 January 05, 2008, 7 a.m., the outside temperature was -13 degree Celsius (8.6 Fahrenheit). Styrofoam insulation or plastic do not absorb moisture! 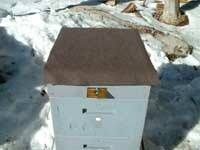 Unfortunately, many beekeepers use styrofoam insulation or plastic on top of their hives. They are glad that their bees survive the winter, but do not consider that their colonies are unhealthy because they are living in a highly humid hives. You have to vent and dry your wool periodecly to avoid moth. Does Cedar Actually Repel Moths? My most energy efficient house.